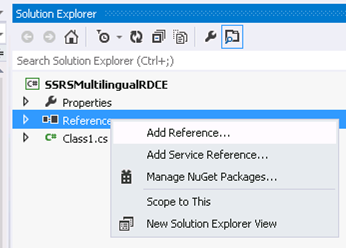 This is the third post in my series about multilingual SSRS reports. If you missed the introduction, you can find it here. I am looking for feedback! Please let me know what you think! The full code of the solution I describe here is available on Github. Let’s first start with the basics: what is a RDCE and what can it be used for? As this post is about making reports multilingual you might already have guessed that one of the uses of an RDCE is doing translations. However, you can also change the report’s look by hiding elements and even change the data set returned. This is useful if you not only need to translate labels in your report but also want to actually return text strings from your dataset in a different language. Another option would be for example to deal with right-to-left languages by changing your report’s layout. An RDCE is a .NET class library, where you will have to select .NET framework 3.5 as the target framework. This class library will need a reference to Microsoft.ReportingServices.Interfaces.dll. This contains the interface you will need to implement (see below). So let’s get started. First off, start Visual Studio and create a new class library project (targeting .NET framework 3.5). The file is located under your SSRS installation directory. In my case the file was in C:\Program Files\Microsoft SQL Server\MSRS11.MSSQLSERVER\Reporting Services\ReportServer\bin. You can explicitly implement this interface to get an idea of the methods you will need to implement by right-clicking the interface name and choosing ‘Implement Interface Explicitly’. Yes, I know I should not have hardcoded the name here, but for demonstration purposes this will do. /// Interface to implement for one RDCE transformation step. The Transform() method takes a report definition in XML format and returns the modified version. The other two parameters provide the report and user context as returned from SSRS. This is handy to dynamically apply transforms based on these contexts. Also implement the ProcessReportDefinition() method that will be called by reporting services. This is the mother-transformation process. What we will do here is load the report and one-by-one call the registered transformations on the report. Find your ProcessReportDefinition() method and replace it with the following (you will need extra using statements). //we have to inform SSRS about what we changed. In this sample we only change the body part of the report. This method first retrieves the report definition. Then all transformations are applied, after which the resulting report definition is returned and SSRS is informed about what we changed. You can specify multiple Transformations by repeating the Transformation node as necessary. Note that Name and Type specify the name of the class and the namespace. Also, each Transformation can have custom properties set (name, value pairs). Now, we can use the SSRS SetConfiguration() methods to get to the configuration settings in the rsreportserver.config file. This enables us to read the list of transformations registered and fill the list created earlier. We will do this by implementing our final function of the IReportDefinitionCustomizationExtension: SetConfiguration() (you will need another using statement at the top of your class). //get the users userName and look up the preferred language. 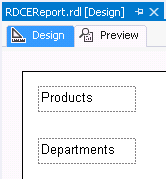 First, copy you RDCE assembly (.dll file, in my case SSRSMultilingualRDCE.dll) into the Reporting Services bin directory (which in my case was C:\Program Files\Microsoft SQL Server\MSRS11.MSSQLSERVER\Reporting Services\ReportServer\bin). If you have referenced any assemblies not in the Global Assembly Cache (maybe you implemented some logging framework) do not forget to copy them here as well. You will need to specify the correct Name for the CodeGroup (just let it match the nam of your RDCE) and the correct location and name of the DLL you copied. You may have to set up the permissions in the web.config file as Holger reports in his blog, although I have not had to do that. This returns among others the ItemID, which you will need for the next statement. What we need to do is add <RDCE>Name_Of_Your_RDCE</RDCE> to the properties of the reports that need to use the RDCE. I have simply copied and pasted the ItemID in the where clause and also copied and pasted the value of property from the previous query into this query. I have appended the <RDCE> element just before the closing of the properties element. My report will now use the RDCE. When rendering a report that uses a RDCE SSRS will display any errors thrown by your code. This helps in debugging. Also note that if you make any changes to the code you will have to recopy your assembly and restart the SSRS service for SSRS to pick up the new version. This report contains two textboxes with labels in them. These labels were defined in the database and the database contains a translation for it. As a result my RDCE will translate these labels, depending on the user’s preferred language. My solution works with a configuration database setting for the user’s preference. However, just as easily one could adapt the code to read the setting from the SharePoint profile (if using SSRS in SharePoint integrated mode) or for example from Active Directory. That concludes my lengthy blog on RDCEs. You can download my solution on Github. It includes a database project that will create the simple database I used and enter some sample data. Also, it includes all code discussed and the sample report I used. The configuration changes are for security reasons not included.